Scientists are finding evidence that diabetes itself wreaks havoc with cholesterol, significantly increasing the likelihood of a heart attack or stroke even higher. The close ties between these two risk factors mean that if you are diabetic, you have to be extremely vigilant about controlling your cholesterol. Researchers are still figuring out exactly how diabetes changes cholesterol levels at the microscopic cellular level. They do know that high levels of insulin in the blood tend to adversely affect the number of cholesterol particles in the blood. High insulin levels act to raise the amount of LDL-cholesterol (the "bad cholesterol") that tends to form plaques in arteries and lower the number of HDL cholesterol particles ("good cholesterol") that help to clear out dangerous plaques before they break off to cause a heart attack or stroke. Diabetes also tends to cause higher levels of triglycerides, another type of fat circulating in the blood. Similarly, high cholesterol can also be a predictor of diabetes; elevated cholesterol levels are often seen in people with insulin resistance, even before they have developed full-blown diabetes. When LDL levels start to climb, experts recommend paying close attention to blood sugar control and starting a diet and exercise regimen to help stave off diabetes and cardiovascular disease. This is especially important if you have a family history of heart disease. For people with Type 1 diabetes, controlling blood sugar can make a big difference. 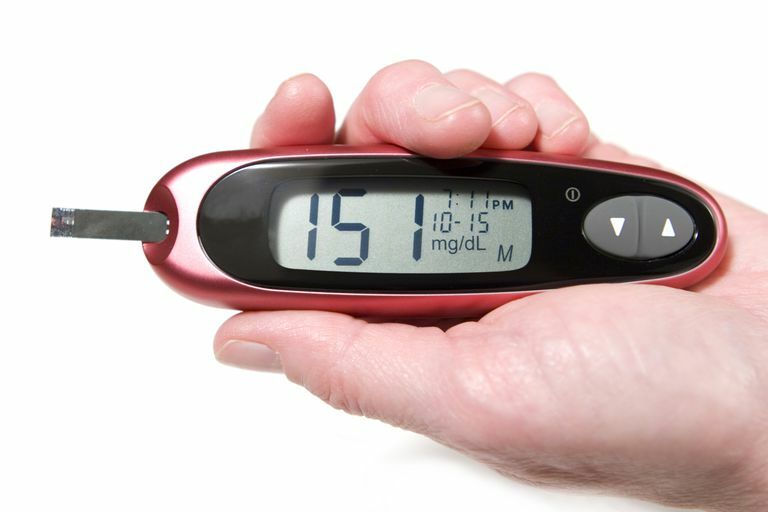 Good blood sugar control is related to near-normal cholesterol levels, similar to those seen in people without diabetes. But people with poorly controlled Type 1 diabetes have increased triglyceride levels and lower HDL levels, which contribute to the development of clogged arteries. People with Type 2 diabetes, regardless of blood sugar control, tend to have increased triglycerides, decreased HDL, and sometimes increased LDL. This cholesterol profile may persist even if blood sugar levels are under control – pointing to an even higher likelihood of developing plaques. In fact, plaques formed in the arteries of people with Type 2 diabetes are often fattier and less fibrous than in people with Type 1 diabetes, leading to an even higher risk of a plaque dislodging to cause a heart attack or stroke. The American Diabetes Association recommends checking cholesterol levels at least once a year, or more often if they are high and not controlled by medication. For people with diabetes and no known coronary heart disease, it is recommended that LDL levels in the blood be below 100 milligrams per deciliter (mg/dL), that HDL levels be above 50 mg/dL, and triglycerides below 150 mg/dL. The recommended blood sugar, or glucose, the level is less than 7% (< 7%) in the HA1C test. For people with diabetes and known coronary heart disease, including blocked arteries or a prior heart attack, the ADA recommends LDL below 70 mg/dL. Reaching this very low LDL goal may require high doses of statin medications, but is shown to significantly reduce the risk of a heart attack. Triglyceride levels should be below 150 mg/dL and HDL above 40 mg/dL. Women with diabetes and existing coronary heart disease are recommended to have HDL levels above 50 mg/dL. One medication, WelChol (colesevelam), has been shown to lower both glucose and cholesterol levels in people with Type 2 diabetes. Welchol acts by preventing the intestines from absorbing fat molecules from food. Although Welchol does lower LDL levels, it can actually raise triglyceride levels in the blood, and should not be used by people with high triglycerides. People who have a cluster of disorders such as insulin resistance, poor cholesterol levels, high blood pressure, and obesity are described as having metabolic syndrome (also known as syndrome X). Studies have found that patients with low HDL and high triglycerides – the hallmarks of metabolic syndrome – have the highest risk of suffering a heart attack or stroke. People with this cholesterol profile also benefit the most from statin medications. The various risks of cardiovascular disease occur hand-in-hand and should be treated together. People with diabetes – who have the highest risk of someday suffering a heart attack – have to be especially careful about keeping both their blood sugar and cholesterol at low levels. It's also crucial to maintain a healthy weight and low blood pressure and to avoid smoking. American Diabetes Association. "ADA Position Statement: Standards of Medical Care in Diabetes." Diabetes Care 30(2007): Suppl 1. Pyorala, K., et al. "Reduction of Cardiovascular Events by Simvastatin in Nondiabetic Coronary Heart Disease Patients With and Without the Metabolic Syndrome: Subgroup Analyses of the Scandinavian Simvastatin Survival Study (4S)." Diabetes Care 27(2004):1735-40. "Third Report of the National Cholesterol Education Program (NCEP) Expert Panel on Detection, Evaluation, and Treatment of High Blood Cholesterol in Adults (Adult Treatment Panel III) Final Report." Circulation 106(2002):3143. Zieve, FJ, MF Kalin, SL Schewartz, MR Jones, and WL Bailey. "Results of the Glucose-Lowering Effect of WelChol Study (GLOWS): A Randomized, Double-Blind, Placebo-Controlled Pilot Study Evaluating the Effect of Colesevelam Hydrochloride on Glycemic Control in Subjects With Type 2 Diabetes." Clinical Therapeutics 29(2007):74-83.